Click a question for the answer! Q: Can a snack be healthy? What if it's sweet and salty? Q: Why are you kernels so big—often twice the size of other brands of popcorn? Q: I like to stock up on your products. How can I keep them fresh? Q: Do you do shows and special functions? Q: Do you do special orders? A: Yes, all our Cloud Night Delights are healthy whole grain treats that are free of gluten, cholesterol, peanuts, and trans fats! Our sweet and salty NH Kettle Korn is made of the finest all natural ingredients—100 % soybean vegetable oil, the best corn seed, 100 % natural cane sugar and gourmet salt—and has just 245 calories in a 3 1/2 cup serving. We use real cow milk cheese from a local farm in Fryeburg, Maine to make our Cheeze Popcorn; while we use fresh creamery butter, brown sugar and spices to make Karmal Bliss. A: Not all popcorn or kettle corn is created equal. Popcorn kernels contain moisture. When kernels are heated to about 400 degrees, the moisture turns to steam, expands, and tries to escape. When there's enough pressure built up for the steam to burst through the kernel's hard outer shell, we hear the sound of the kernel: POP! The kernel turns itself inside out, and that's the part we eat. A: Our NH Kettle Korn and other products will stay fresh for 3 to 4 weeks. To enjoy munching, put the snack in a bowl and reseal the bag so it will remain fresh and crispy. You can extend the freshness and life of your NH Kettle Korn and other Cloud Nine Delights products by months by placing them in a freezer-safe container or freezer bag in your freezer. Since our products don't absorb moisture, they're not frozen in a solid state. Therefore they can be eaten right out of the freezer. A: If you're interested in having fresh popped homemade NH Kettle Corn or any of our other products made at your special event, festival, fund raiser, street fair or corporate function, let us know. Just call or e-mail us and we will be happy to discuss your ideas. 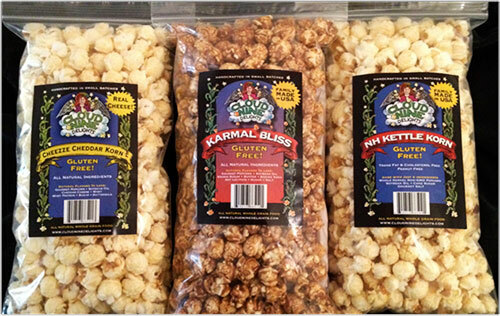 A: Yes, we do special orders, such as with NH Kettle Korn with no salt, or bagged for use as gifts and wedding favors. For more information, email us at info@nhkettlekorn.com or call us at 603-494-3445 to discuss how we can help. A: As our products are perishable, all food products cannot be returned. Cloud Nine Delights will be happy to replace any item(s) in the unlikely event that they might be damaged or spoiled during transit. To make sure that you are satisfied with the product you receive, please inspect the contents as soon as your order arrives. We wish we could assure proper handling and prompt receipt of packages once they have been delivered to the correct mailing address by the third party carrier (UPS, FedEx or USPS), but this, of course, is out of our control. Refunds can only be credited to the originating credit card. If you are not satisfied for any reason, please don't hesitate to contact us. 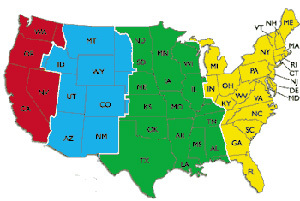 A: We ship to the continental United States.